This book explores the process of transformation, discussing how individuals are capable of acting to enable transformation of structures and cultures through the lens of South African higher education. Agency and Social Transformation in South African Higher Education examines the role of agency in effecting change amidst the conditions of South African Universities. Arguing for a focus on transformation from below, it explores transformation and agency from the perspective of academic staff. Through discussing moments at which faculty members embedded in rigid structures and cultures perceive themselves as having had the agency to interrupt and transform them despite their rigidity, this book describes the nuances of social action and agency within the South African higher education institutional context, and the ways in which contextual histories may provide enabling/limiting conditions to individuals within them. This book makes an important contribution to the field of agency and social transformation theoretically, methodologically and geographically, as it details the motivations for transformation, how individuals become agents of change and the practical experiences of these individuals from a localised perspective. 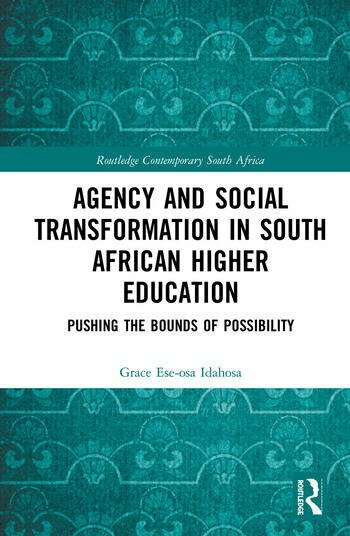 Agency and Social Transformation in South African Higher Education will be of interest to scholars and students of African higher education, transformation studies and postcolonial studies. Grace Ese-osa Idahosa is a post-doctoral fellow at the Centre for Social Change, University of Johannesburg, South Africa.